I am in the midst of a sewing marathon because Beth and I have been invited to have a trunk show at The Cottage in Leesburg, Virginia. They are having their Holiday Open House on November 2 – 4. 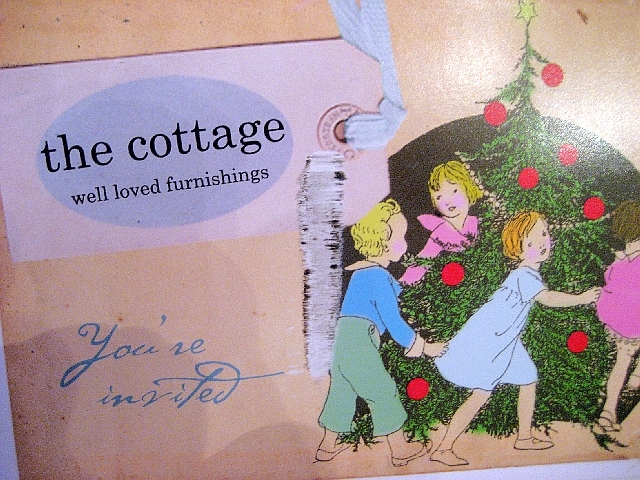 The Cottage is a lovely store that has wonderful vintage furnishings and home decor. 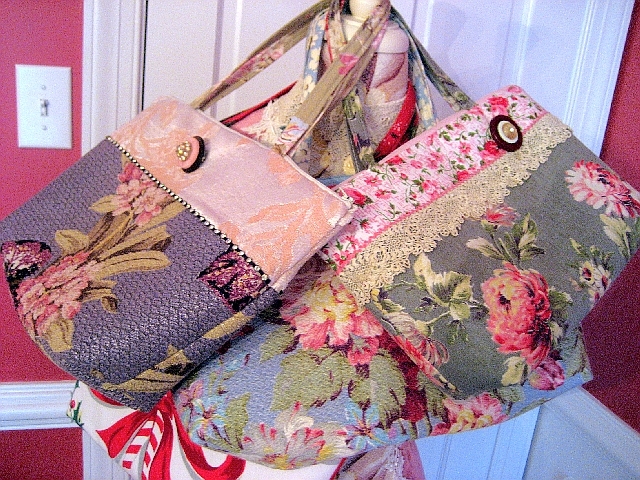 Here is a peek at some of the purses that I am making out of my very best vintage fabrics. I am making zipper closures for most of these bags so I have made pins or brooches out of stacks of vintage buttons to go with them. Love these! Beth and I will be at the store on Friday so please stop by if you are anywhere near Leesburg that day! Gorgeous gorgeous gorgeous as always Suzy! Your bags and buttons are D=vine miss suzy. Sure to be a hit!! so fun!!! your mirror rocked!! Great bags!!! Love the little button pins too. Good luck!! I love the bags and the buttons…OMG the buttons are to die for!!! 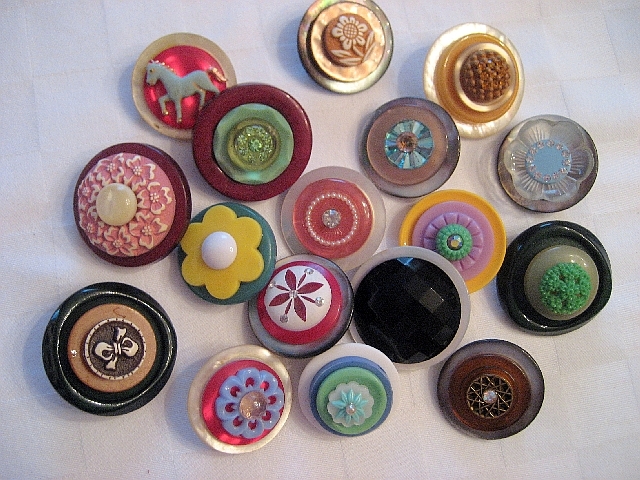 I am jealous of your vintage button collection…is that wrong? 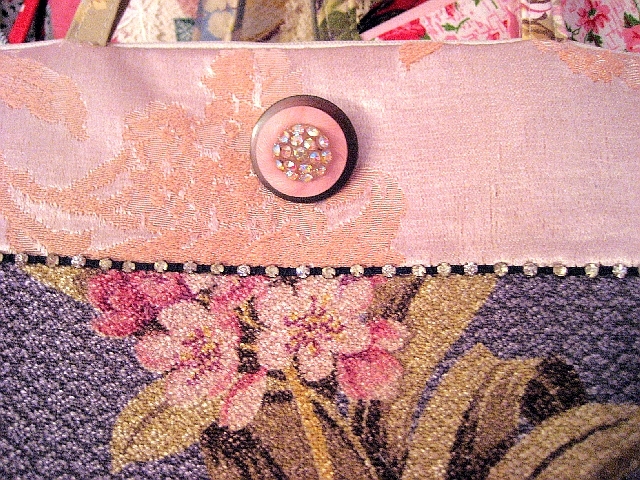 Gorgeous bags and I love the stacked button pins. I hope you have fun and sell a lot at your trunk show! These totes are darling! Hope it was a good show for you!! Hello ~ Had such fun visiting these lovely little buttons and bags. I almost went to Hampton for the firs time this past weekend for a conference, but due to rain and feeling under the weather, I did not go. I love your little vintage table next to your kitchen island…so pretty.